Next Big Step for Pot Business: Banks? (Newser) – The Obama administration will soon take the radical step of allowing legal pot businesses to actually put their money in banks—sort of. At an event yesterday, Eric Holder said he was working with the Treasury Department on new regulations and would unveil them "very soon," Politico reports. "There's a public safety component to this," the attorney general explained. "Substantial amounts of cash just kind of lying around ... is something that would worry me, just from a law enforcement perspective." 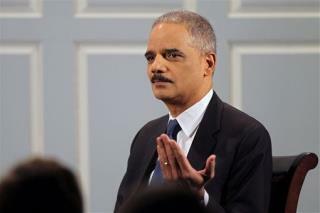 Thanks to Eric Holder, and the FBI, fiends like Viktor Bout are behind bars! He was a Russian arms dealer. He tried to sell arms to Colombian outlaws! They wanted to murder American pilots! The FBI nabbed him! Bush's golfing comrade, Vladimir Putin, has already demanded his release! Republican bankers obey the law? Remember Charles Keating? He was a friend of Senator McCain. He is now behind bars! Remember Noel Bush? He was the bank president of Silverado until it went bankrupt! Remember Bernard Madoff? Whose administration had him put behind bars?